Tonight may be the biggest night so far for the Jacksonville Beer Week. There is the eagerly awaited Downtown Pub Crawl, and several tap takeovers at the beach. So, no matter what part of town you are in, there is something for you! The first ever Springfield Brew Crew Downtown Pub Crawl will take place with registration beginning at 5:30 in the Landing Courtyard. The crawl will leave the Landing for stops at Fionn MacCool’s, Burrito Gallery, Burro Bar, and Northstar Substation at 7:00. Along the way there will be drink discounts, raffles for great prizes, a Grand Prize drawing for an Intuition Ale Works Mug Club membership, and lots of other surprises. Tickets for the crawl are $15 with all proceeds benefiting disadvantaged children in the urban neighborhoods surrounding downtown. You may purchase tickets online at http://www.sprbrewcrew.com or at the event. The tap takeovers continue to night at Engine 15. Tonight you will find a special firkin made by the Engine 15 brewers and Old Battle Axe run through the Randall. You will also be able to partake of 10 other taps from local brewers. More taps taken over with as many as 30 local and Florida brews taking up handles at the beach brewery. Several of the brews that will be available tonight are here in Jax for the very first time. Tonight there are several great events for your American Craft Beer Week beer drinking pleasure. For those of you who live at the beach, Engine 15 is pairing some awesome food with truly outstanding beers. Mug Club members at Intuition Ale Works are invited to a special preview of the new beers Ben and Andrew have brewed up for the Jacksonville Craft and Import Beer Festival. And the Mellow Mushroom in Tinseltown has an exciting vertical tasting of Sierra Nevada’s Bigfoot. Join them tonight for this delicious pairing! Beer and pizza, is there any better combination? I think not! In the beer community, the ‘Shroom has become legend. 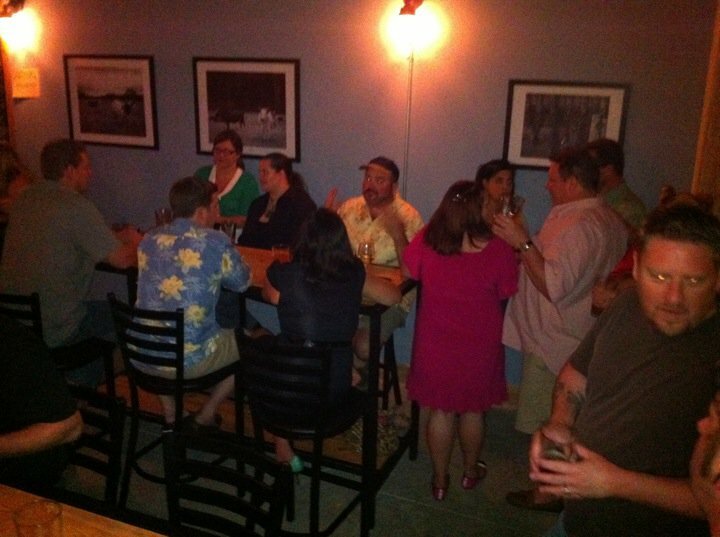 Not only do they quality beers on tap, but the regularly hold special event evenings focusing on specific breweries. For American Craft Beer Week they are highlighting one of the original brewers of the craft beer movement — Sierra Nevada. Tonight you have a unique opportunity to taste one of Sierra Nevada’s greatest accomplishments — Bigfoot — as a vertical tasting. What does this mean exactly. Well, you will be able to taste several years worth of this tasty brew side-by-side so you can enjoy the nuances and subtle changes in taste that this beer has as it ages! Get to this one early so that you are sure to get in on this one-of-a-kind tasting! Tonight Brewmaster Ben Davis unveils two new brews he created especially for American Craft Beer Week and the Jacksonville Craft and Import Beer Fest. But, you have to be a Mug Club member to get it! That’s just one of the many great perks to being in that hallowed and prestigious club. Don’t worry, I’ll let you know how they are. And you can always come to the Fest on Friday and try it for yourself. First two people who find me at one of these events tonight will be showered with fabulous prizes — OK, more like t-shirts and assorted other beer schwag! But, that’s still good, right? And don’t forget to get your tickets for and attend the Jacksonville Craft & Import Beer Festival this Friday at the Jacksonville Memorial Arena. There will be food, entertainment, and LOTS of beer tasting. Tickets are $45 for VIP admission at 6:00 PM or $30 for General admission at 7:00. To kick off American Craft Beer Week, what better place could there be than Kickback’s in Avondale. Steve Flores owner of the neighborhood watering hole has amassed an amazing number of taps that are always attached to kegs of amazing beers. Sample beers from Jacksonville’s largest selection of draught brews – 84 to be exact. If you are looking for something good to drink and can’t find it here, you just aren’t trying. The available beers are constantly changing, so there is always something new to try. Come by for prizes and fun with Team Hopheads and the gang at Kickback’s. First two people who find me will be showered with fabulous prizes — OK, more like t-shirts and assorted other beer schwag! But, that’s still good, right? Springfield Brew Crew May Event a Huge Success! I would like to take this opportunity to thank everyone who came to the Springfield Brew Crew event Saturday night at Intuition Ale Works. A wonderful time was had by all! And, I don’t have numbers yet, but I am positive we made a lot of money for the American Cancer Society. If you were unable to attend and still wish to make a donation to the Relay for Life benefitting the American Cancer Society, you may do so by going to the Springfield Brew Crew website and clicking the link on the Home page. Thank you, again to everyone who made this such a wonderful evening! It was 4:00 a.m. in the tiny Midwestern suburb, the air was cool and still outside when a siren pierced the silence. The young boy woke to the sound of the siren wailing. During his short life he had learned to tell the difference between a police siren and a fire truck siren. The siren he heard that night definitely came from a fire truck. The boy knew his father was on duty that night and on his way to another fire or accident. He knew that that meant his father was in danger again. I was that young boy over 40 years ago. I was the son of a firefighter. Last week I told you about how my father was a very deep man; a man who held out hope that the family he was leaving would carry on. Today I want to tell you about the hero that he was. There are still nights when I am awakened by the sound of a distant siren and reminded of how I felt as the son of a firefighter. Often, as a child, I would lie awake after hearing that siren and wonder if my father would walk through the door in the morning when his shift ended. Horrible scenarios would run through my mind of my father trapped in a burning building, his crew desperately trying to get to him before the roof collapsed. Or my mind would insist that an explosion had occurred and my father was caught in the debris field, forever lost in a rain of sharp metal and burning cinders. I was plagued by images more terrifying than any child should have to imagine of Hell-like landscapes, my father in the center of them. But, every morning at 6:15 my father would walk through the front door as I prepared for school, sometimes still sooty from a fire the evening before. He’d smile at me and tousle my hair before kissing my mother and heading for a shower. He took his work seriously. In his 20-year career as a firefighter he saved countless lives, helped deliver babies, fought merciless infernos, and even saved a cat or two. He left home every morning with full knowledge that it could be his last seeing his family, that any day any day on the job could bring an end to him. He understood and accepted the risks of his job because he existed to serve his fellow man. He was selfless, dedicated, and courageous. He saw no distinctions between color, age, social status, or political affiliation. If you were in danger or need, he would risk his life to help you. My father never backed-down from a fire, never wavered in his resolve to preserve life and property from the ravenous beast that a fire can be. He plunged headlong into his job always believing he was making a difference, that the life he saved that day would enrich the world in some way. In the end, by doing what he did, he enriched the world. But, even this heroic man could not defeat the horrendous monster that took him. He deserved better. I am the son of a fallen hero. He was a firefighter, a husband, and a father. He was violently taken from us 30 years ago by a foe even he could not fight: cancer. He was, and will forever remain, my personal hero. This Saturday, May 14th from 7:00 PM to 11:00 PM you have an opportunity to revere the memory of this man with me. Intuition Ale Works is generously donating $1 from every beer sold at the May Springfield Brew Crew event to the Relay for Life to benefit the American Cancer Society. The event will be a celebration of my birthday which I shared with my father. We will laugh, drink great beer, enjoy each other’s fellowship and friendship, and remember. If you cannot make the event, I hope you will consider making a donation to the Relay for Life. You may do so at the Springfield Brew Crew website – www.sprbrewcrew.com – just click the donation link on the home page. Earlier this week I promised to share information about my father as a lead up to the May Springfield Brew Crew event. The event is to be a birthday celebration for me and a remembrance for my father who shared the same birthday with me. Gregory H. Wisdom, my father, was taken from us in August of 1991. His killer’s name was lymphoma, a form of cancer that attacks the body’s immune system. My father was a firefighter in Hazelwood, Missouri, the small-town suburb of St. Louis where I grew up. He was an extremely dedicated man and worked hard to improve himself and his skills as a firefighter, a man, and a father. His dedication inspired me to seek adventure, never accept mediocrity, and continuously improve myself. He was a hard-working man working 24 hour shifts at the fire department and, on his days off, working long days as a paint and wallpaper contractor. He was not, however, an educated man. In high school he became bored and restless. History and geography lessons fueled his restlessness and stoked his desire for adventure. So, at the age of 16, he dropped out of one of the best prep schools in St. Louis to join the Coast Guard. He had a zest for life that was unstoppable. The adventures he found in the service of our nation led him from the Caribbean Sea to remote lighthouses miles off the coast of Maine. He had a way of throwing himself headlong into his work, pushing himself to be the best. His was not book knowledge; he possessed knowledge of how the world worked through the school of hard knocks. He learned that a man who was willing to work hard could prosper. My father worked hard at his two jobs to make sure we had everything we needed. He approached his role as the head of household and provider very seriously. Often he worked long into the night painting houses to get the extra money needed to take us on fantastic vacations. As children we visited the Grand Canyon, San Francisco, Monument Valley, Williamsburg, Virginia, and Washington D.C. among other places. He arranged with our teachers for these trips to provide educational opportunities, and our teachers provided him with lessons and activities for us to complete for school credit. He was dedicated to providing us with quality educational experiences as well as the material needs of a growing family. But, in the spring of 1981, he visited me during my fraternity’s parents’ weekend and broke the news to me that he was being admitted to the hospital with cancer. He was hopeful that he could beat the monster known as lymphoma again – he had had it before and fought it to remission. But, the doctors were not so sure. In the end, his fight was valiant, but unsuccessful. At the age of 44, he succumbed to his attacker and slipped away from us. I ask that you come and celebrate his life with me at Intuition Ale Works, Saturday, May 14th from 7:00 PM to 11:00 PM. The wonderful friends I have at Intuition have made a very generous offer to donate $1 from every beer sold that evening to the Springfield Relay for Life which benefits the American Cancer Society. Help us put an end to the scourge that took my father from us and come have a few pints to remember the man that he was.